Follow Joe (the owner) through a typical day in this 2 minute video. This is your chance to get into a rapidly growing, $50 billion industry, right on the ground floor. We have two types of franchise opportunities available, and we have prime territories available for you to grow your business. A franchise system is only as good as each of its individual franchise owners. That’s why we’re selective in choosing candidates who are qualified and motivated leaders, committed to long-term growth, and excited to join a customer focused business. Our Customer Contact Center is not just a call center. It’s a team of highly trained salespeople who are there to make your life easier. 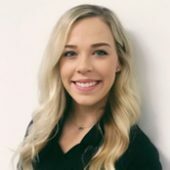 The friendly team is available to answer customer questions, overcome objections, and book jobs with your location directly on our online booking schedule. 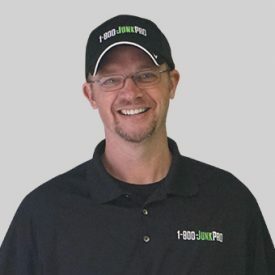 1-800-JUNKPRO franchise owners benefit from multiple revenue streams. Offering both dumpster rental services and junk removal services sets us apart from the competition. Either one is great business on its own, but our franchise owners get the benefit of two business for one franchise fee. You get exclusive access to both revenue streams in a protected territory, giving you the freedom to grow your business without overlap or competition from other franchise owners. From the moment new franchisees sign their franchise agreement they become a part of our family. Our processes, team members, and resources are all aligned to deliver the education, motivation and support to successfully launch your new business, and continue for the life of the business. WE are a TEAM. To be successful in this franchise, you must have sufficient capital to launch, operate, and grow the business. Interested in seeing our financials? We're proud to share our full Item 19 from our franchise disclosure document. In a nutshell, we’re a team of fun-loving lovers of fun, who love giving our customers the best customer service on the planet while having a great time doing it. More on that later. As far as the service we provide, there are 2 sides, Dumpster Rental for the do-it-yourselfer, and full-service Junk Removal for anyone wanting us to lift, carry, load, and haul away their items from anywhere on their property. Our franchise partners have exclusive rights to both services in their territory. 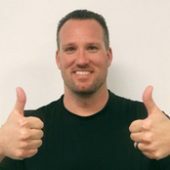 During your discovery process, you’ll learn that this dual-income franchise system has many benefits and is a very solid business model built for long-term success. We’re serious about giving our customers “The Best Customer Service on the Planet.”But as we mentioned before, we also love FUN and strongly believe it’s important to have a blast together at work. We think this culture is key to growing our brand to be the biggest powerhouse in the industry, not just another participant! Why? Because customers notice the difference. The waste removal industry is often mocked for grumpy employees and poor customer service, but our team members are happy, friendly, and helpful. They buck those trends in every way. 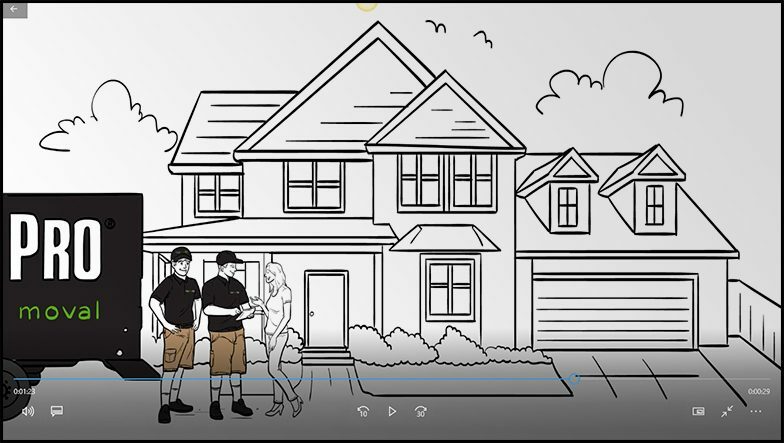 Customers choose us because of the impression they get when they first inquire, and they keep coming back because of the exceptional service our truck team members provide. Our Core Values aren’t just an inspirational piece of wall art that we point out during orientation. They guide our decisions each and every day. From helping customers, discussing ideas for new projects, deciding on the best solution for a special request, or hiring new team members. 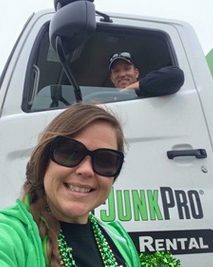 Mike and Misty Davis opened the first 1-800-JUNKPRO location in Wichita, KS, in 1999. Unlike so many other stories, this one doesn’t include an entrepreneur with a clear view of the future. Both 20 and with no formal business education, mentors, or idea of what the company would look like, Mike and Misty were simply looking to earn a little extra income and keep food on the table for themselves and their two beautiful daughters. Over time, the business grew, and in 2006 a vision was born. They went to work developing processes and systems that could be scaled up to reach the goal of 333 profitable locations and achieve $1 billion in revenue. In 2016 they granted their first franchise and haven’t looked back since. 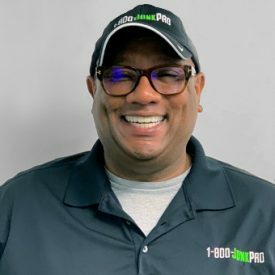 "I’m a 1-800-JUNKPRO franchise owner in Kansas City, MO. I started June 2016 with one truck and twelve dumpsters and in less than two years I have grown my territory exponentially. I now have three dumpster trucks, fifty seven dumpsters and a junk removal truck. 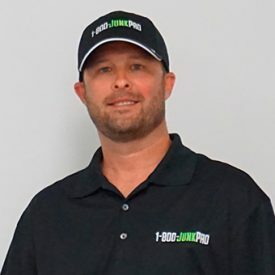 1-800-JUNKPRO has aggressively helped me grow my territory in a very short amount of time and I look forward to continuing my expansion." 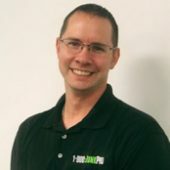 "As I was researching franchises I came across 1-800-JUNKPRO. 1-800-JUNKPRO was willing to offer me a much larger territory than all of the other franchises I looked at. It’s very exciting to be one of the first franchises in the system. The support and assistance I receive from the 1-800-JUNKPRO team is outstanding." 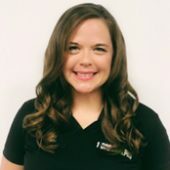 "I looked at several different types of franchises in several different industries – food industry, real estate, services, and retail. However, none had all of the attributes I was looking for. For example, recession proof industry, reasonable upfront costs, exclusive territory, no large number of staff, and exceptional franchise system that could be easily duplicated. I found exactly what I was looking for with 1-800-JUNKPRO. When I met Mike, Misty, Brittany, Zach, Shawn and JJ, I felt like I was home with family." Ready to learn more? Awesome! It all starts here. Fill out the form below and we'll be in touch soon. Copyright 1999-2019 © 1-800-JUNKPRO, LLC. © All rights reserved.